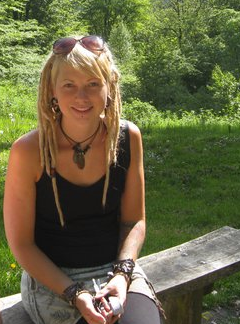 Behind DreadHeadshop is dreadhead, dreadlock expert and owner Lisa Tägtström. I have always loved dreadlocks and when I moved into a more alternative way of life, there was no doubt that I had to have dreadlocks. -And I have loved my locks ever since. My dreadlocks were made in 2006 but they were not really a success. After a while, I began to use a crochet hook and tried to maintain my fluffy dreadlocks. At that time it was difficult to find information about dreadlocks and the right products for washing and maintaining them. All the good products were sold in the US and ordering a single product from the US is not as sustainable choice for our planet and very expensive in shipping. Therefore, I decided to start an online shop selling my handcrafted clothing and some dreadlock products. Unfortunately, today I do not have the time to create as much clothing and jewelry as I use to, because I have swapped the sewing machine with a laboratory. By hand, I produce all the RAW ROOTS dreadlock products. –But you will still find handmade headbands, beads and jewelry in the shop. Inspired by the primitive and alternative lifestyles I select each and every product you find in the shop. Some purchased locally and others bought on trips to distant and more authentic corners of the world. Nature, travels and alternative festivals inspire me to seek out new and better products, tools and materials that match the lifestyle I live. I have worked as a hairdresser since 1999, both in a salon and as an independent. I have been working with many different heads and hair types, and discovered how important it is to care for your hair and not least your skin / scalp. Therefore, I have chosen only to sell all natural dreadlock products, which protects the hair and skin as much as possible. All products are free from artificial fragrances, silicones, paraffin, SLS, mineral-oil and parabens. Over the last 10 years, I have done a lot of work on dreadlocks and discovered how important it is to use natural and gentle products since scalps with dreadlocks are very exposed and vulnerable. All products on this site are appropriated specifically to this type of hair and scalp, helps to clean and maintain your dreadlocks in the easiest and most natural way. Over the last years I have produced and developed my own product line for dreadlocks, called RAW ROOTs. The entire product line has been carefully considered so that nature and content blends into a higher level. I try, whenever possible, only to use organic ingredients, but where this is not possible, the ingredients are still naturally based. All products are mild and can be used by anyone, even if you do not have dreadlocks. I hope you find my website useful and if you have any questions feel free to contact me using the contact form or mail.